For the summer collection, inspired by the colors of Africa, the brand has chosen a special photographer to document the journey and the encounter between the two cultures. Valentino has focused on a photographer’s level for its advertising campaign for spring-summer 2016. Steve McCurry, in fact, famous for his photos around the world published in National Geographic Magazine, the brand has accompanied the discovery of Kenya. Usually the photographer does not work in the fashion industry and its best-known pictures as “The Afghan girl”, are portraits stolen from the costumes to people so far away and different from ours. It was precisely his ability to tell the stories of those who immortalizes that led him to this position. A position he accepted with enthusiasm:“Photography is always a search for the best solution to a puzzle and create an extraordinary emotion, telling a story. The idea of these photos is to take the viewer on a journey through places and local people, “ he said. The collection, designed by Pier Paolo Piccioli and Maria Grazia Chiuri, is inspired by African culture among models and colors, with the inevitable animal on the continent. During this trip, the brand has come to compare with the clothes and the original traditions, in a climate of deep respect. In this period in which what is different and seems to be a terrifying enemy, the models Cameron Traiber, Greta Varlese, Alice Metza and Kirin Dejonckheere have integrated with its surroundings, wearing the colorful creations. 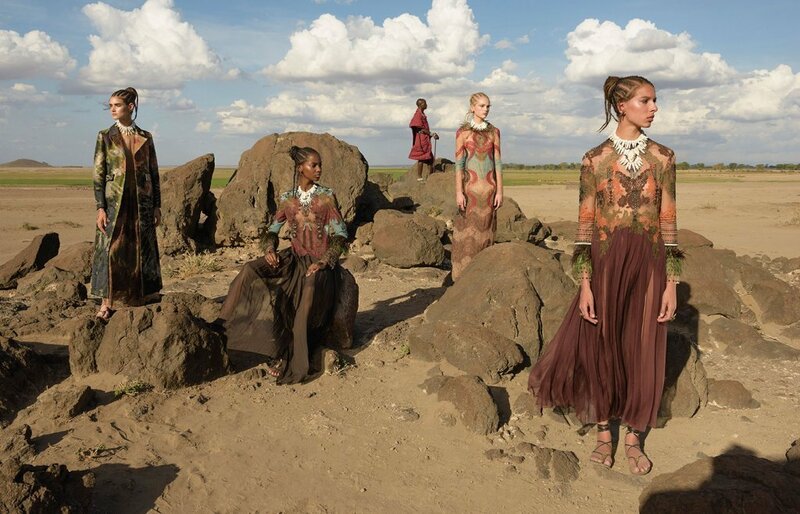 In the background of Amboseli Park, two cultures met and shook hands: the Italian fashion house has sent a message of peace, rare these days. Previous post: What to buy with the winter sales?